There are many different systems out there: Color Me Beautiful, Color Me a Season, 4×4… The system that I prefer, and the one I know the most about, is Sci/ART, so this series will talk about the seasons as defined by Sci/ART. I prefer it because I haven’t found a system with more than 12 seasons where I think the splitting of seasons, etc. is warranted, and the traditional four seasons is too simplistic. The palettes I see in the Sci/ART system are the ones I see repeated in nature, and the ones clothing manufacturers also seem to stick to, even though I doubt they are actually using these palettes to design their clothes and select fabrics. The fans themselves are beautiful to look at because they harmonize so nicely, and it is pleasing to the eye. I don’t get the same feeling when I look at palettes from other systems, apart from custom fans. Sci/ART was developed by Kathryn Kalisz, and uses 12 seasons. Currently, Sci/ART, or something based on it, is practiced by several analysts who were trained by Kalisz. There is also the 12 Blueprints system, developed by Christine Scaman based on Kalisz’s work. There is a robust 12 Blueprints training program, so many of the analysts you’ll find who work with 12 Seasons are 12 Blueprints analysts. For the sake of clarity, I am using the term to refer to the system as it is currently practiced, although some things may differ from how they were in Kathryn Kalisz’s time. I am using it to distinguish the systems based in her work, vs. Color Me Beautiful’s 12 Seasons, for example. Sci/ART looks at three characteristics of color: hue (warm vs. cool), value (dark vs. light), and chroma (soft vs. bright). BRIGHT SPRING is medium-warm in hue, medium in value, and high in chroma. TRUE SPRING is warm in hue, medium in value, and medium-high in chroma. LIGHT SPRING is medium-warm in hue, light in value, and medium in chroma. LIGHT SUMMER is medium-cool in hue, light in value, and medium in chroma. TRUE SUMMER is cool in hue, medium in value, and medium in chroma. SOFT SUMMER is medium-cool in hue, medium in value, and low in chroma. SOFT AUTUMN is medium-warm in hue, medium in value, and low in chroma. TRUE AUTUMN is warm in hue, medium in value, and medium in chroma. DARK AUTUMN is medium-warm in hue, dark in value, and medium-high in chroma. DARK WINTER is medium-cool in hue, dark in value, and medium-high in chroma. TRUE WINTER is cool in hue, medium in value, and medium-high in chroma. BRIGHT WINTER is medium-cool in hue, medium in value, and high in chroma. 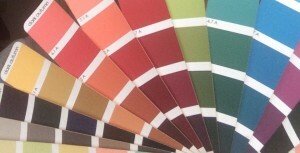 If you would like to see how these palettes look, you can see them on this page on the Invent Your Image website. Lisa K. Ford is a Sci\ART analyst who has created her own digital images of the palettes, and since they were created for the screen, they are the most accurate renditions of the palettes you’ll be able to find, outside of holding one in your hand. The information about where each season can be found on the scales of hue, value, and chroma can be found on these palettes. Just reading over the list, several things should become clear to you. Each season is at the extreme end of the scale for only one characteristic. No season would be, for example, both high in chroma and at the highest level of warmth. Also, no season is medium in hue. The seasons are either warm or cool, but seasons that are not at the extreme level in hue are called “neutral seasos,” since they have a slight influence from another season in the opposing hue group. Seasons that share the same dominant characteristic share a modifier. The True Seasons are True Spring, True Summer, True Autumn, and True Winter. True Winter and True Summer are both cool, but since summer is the lower-chroma cool season, True Winter is medium-high in chroma and Summer is only medium. True Spring and True Autumn are both warm, but again, Spring is the higher-chroma warm season, so True Spring is medium-high and True Autumn is medium in chroma. All True seasons are medium in value. The rest of the season are neutral seasons. This means they have both warm and cool influences. The Bright Seasons are Bright Spring and Bright Winter. The Bright Seasons are a combination of Winter and Spring. Since both Winter and Spring are the higher chroma seasons, you get seasons that have maximum chroma. Again, they are medium value, and medium-cool and medium-warm, respectively. The Soft Seasons are Soft Summer and Soft Autumn. The Soft Seasons are combination of Summer and Autumn. Since both Summer and Autumn are the lower chroma seasons, you get seasons that are the lowest in chroma. Otherwise, they are medium in value and medium-cool and medium-warm in hue. The Light Seasons and The Dark Seasons are combinations of Spring and Summer and Autumn and Winter, respectively. Spring and Summer never get darker than medium value, and Autumn and Winter never get lighter than medium. What is interesting about these two pairs is that the Dark Seasons are dark in value, medium-cool/warm in hue, and medium-high in chroma—but the Light Seasons are only medium in chroma. Autumn and Winter are darker seasons, so their combination creates a pair of Dark seasons. Spring and summer, being lighter, create a Light pair. You may have noticed that the seasons flow into each other, and even correspond to months of the year. True Winter is January, February is Bright Winter, and then onto Bright Spring in March and the rest of the year, ending with Dark Winter in December. The seasons reflect the changes of the seasons and the way the world looks in climates that experience the four seasons in the Northern Hemisphere. An important aspect to the Sci/ART is that the hue/value/chroma descriptions belong to the colors that flatter a person, not the person. What I mean by this is that you will not necessarily know whether a person is Bright, Light, Dark, Soft or pure Warm/Cool just by looking at them. A Bright person will, in most cases, not have platinum blonde or jet black hair and skin that contrasts with their hair. In fact, their hair may look downright mousy until you put them in the correct colors, and the multi-dimensional quality of their hair (which is an effect that happens with all seasons) can come through. Same with the Dark and Light Seasons. There may be people in other seasons who look darker than someone who drapes as a Light, and same with Dark. While the representations of Light celebrities are almost all blondes, and no one would think to put a blonde in a Dark season collage, when you look at people who drape these seasons, that is not the case. There are Dark Autumns and Dark Winters who are natural blondes with blue or green eyes and pale skin. So how does a “light” person end up a Dark? And what does “Dark” even mean, since, looking at the palette, both Dark Autumn and Dark Winter have strips of pastels, referred to as “icies,” which are found in all of the Winter-influenced palettes, and Dark Winter even goes all the to white? In some systems, Dark Autumn and Dark Winter are “shaded” seasons, which means they are the “pure” season plus black, but that’s not the case here. What it means for those of us who are in the Dark seasons is that, since Dark is the dominant characteristic of our season, we can wear most Dark colors without a problem that anyone but a trained analyst would notice, but that everyone around us will notice an issue with Light colors unless they harmonize perfectly with our season. I’m a DIY Dark Autumn, and put me in a Light color, and I will look very puffy, and either extremely red or like I have a beard of white powder. It doesn’t matter how much sleep I’ve gotten; I’ll look like I’m coming off a three-day bender. If I am put in another season’s dark colors, I’ll look a little “meh,” but nothing quite so terrible. Nobody would have put me in anything even remotely close to a Dark season until I started testing colors. It’s all about what the colors do to you, and you really have no information until you can see colors on you.